OK, one or two of you have seen this; it was the first thing I posted(I think) and what took me so long to get it back was this: I uploaded them on an IMGhost service, but they were all resized to a decent size, 1024x768, and to save space, all my old Lego pictures were put on a CD and removed from the computer. Only now do I find the CD, put it in, download them to Flickr off the CD, and get them in agreeable sizeage. As usual, more detailed and larger pics in the Photostream. The Juggernaut I built some time ago, after I got the Temple of Akator I think, because I got a massive amount of tan bricks from that set. 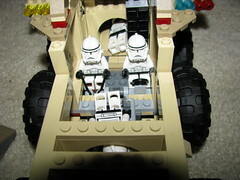 It seats two clones in the cockpit; you can see one crawling back into the engine room, and one crawling forward into the viewport. Above the engine room, it fits about 6-7 clones; overall the most clones I could fit inside was about 12 clones. The windshield opens up; it is armed with two dual turbolasers, two dual side anti-personnel lasers(constructed with the skulls of fallen beasties? why not? ), and a rear missile silo. 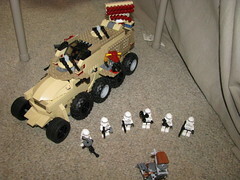 I also might add that I was doubly inspired to make a Juggernaut-type craft when I found I had eight bubbly tires from the Batman Tumbler and Harley's hammer truck. The two front wheels are also from the Tumbler. Project 13 was something I made because I wanted to give the Juggernaut something to battle. 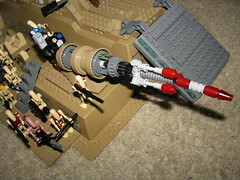 It's a long hyper-velocity laser, obviously, manned by a battle droid, and built on Geonosis. ^Yeah I thought the same thing. Pretty cool. I like the giant missle launcher thing.